It has been a good one here today. It was seasonal temps, and I got lots done. I was outside in the sun, edging one of my flower beds...nice to be out. 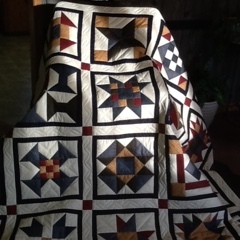 I also finished piecing this custom order. 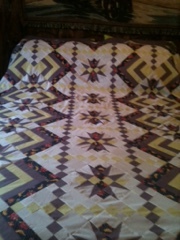 This is a very pretty quilt that I will start hand quilting in a few days. 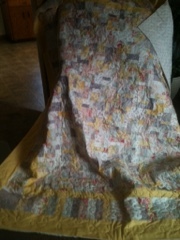 I finished quilting this next one on my Tiara this afternoon. This is a disappearing nine patch that I did with our local fabric shop...pieced on a monthly basis. I am working on the binding of a customer quilt now. And will start piecing a monopoly quilt soon. This is the finished sampler from last week. Almost forgot...I opened my shop this afternoon, and had this wonderful lady from Israel in for a talk...so very nice. 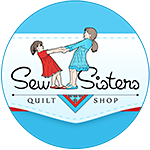 some pretty quilts which you will lift to a higher level with your quilting, not sure what a monolopy quilt is so look forward to seeing it. 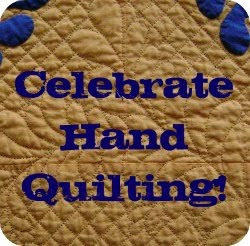 I hope to get into the garden today quilting permitting! Some very lovely quilts Marjorie, you have been super busy . Nice to get outside now isn't it . We finally lost all the snow we got a few days ago so it looks like spring again .